Oh, hello there. Big Jump Press is the imprint of Sarah Bryant. Under this name, I produce letterpress printed artist’s books, prints, broadsides, and hand-bound books. I started Big Jump in 2005 in Tuscaloosa, Alabama while an MFA student at the University of Alabama. After teaching for a few years at the Book Arts Center at Wells College and a few years teaching workshops and short courses all over the United Kingdom, I am back in Tuscaloosa teaching for The University of Alabama. For more information about Big Jump, visit http://www.bigjumppress.com or find me on facebook. For more information about Alabama Book Arts, check us out online Thanks for reading! 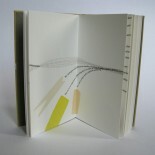 Awesome blog… I love how you link bookbinding and letterpress. Thanks! Enjoying your blog and website. Thanks for sharing your work. By chance did you get to know Linda Samson-Talleur while at Alabama? Linda is a good friend, colleague and once my mentor at the University of Kansas in the early 80’s printmaking department. She taught me letterpress, and book arts. An incredibly talented woman. No I didn’t know Linda while I was at Alabama, although I’d love to meet her sometime. I believe she passed through the Alabama program much earlier than I did; I didn’t head to Tuscaloosa until 2005. It would be lovely to be in a room with all of the talented printers (and binders) that emerged from that program. My best to you and Linda. Sarah, I was introduced to your work at the Press and Release exhibition. Stunning work! Your books were both mine and my friend’s favourites. We felt very inspired after having a good look through them. I hope to attend a workshop of yours some time! Looking forward to seeing more of your wonderful creations. Thanks so much for your kind words! Forgive the delay in my reply, I’m moving and still have no internet in the new flat. I am so glad you enjoyed the books, and I hope I see you at a workshop sometime soon! This is terrific Sarah. Saw it on Book Art listserve. I’m a change of life book artist. Have plastic letters & will try using foam I retrieved from clean dumpster & litho stones from unclean print studio. Hi Celeste! So glad you found the post useful. Best of luck with the dumpster foam!